PHOTOS: Sarah Hyland Is Stunning On The Red Carpet At 2015 SAG Awards! ABC’s Modern Family star, Sarah Hyland, looked stunning in a studded brown dress as she walked the red carpet at the 2015 Screen Actors Guild Awards held at the Shrine Auditorium on Sunday (January 25) in Los Angeles, California. Sarah wore a custom Vera Wang gown with Brian Atwood shoes, a Jimmy Choo clutch and Lorraine Schwartz jewelry. Be sure to check out more pics of Sarah on the red carpet in the gallery below! PHOTOS: Sarah Hyland Dresses In Multicolor For “TrevorLIVE LA” Event! Modern Family star, Sarah Hyland, looks absolutely fantastic in a multicolored dress as she attended ‘TrevorLIVE LA’ Honoring Robert Greenblatt, Yahoo and Skylar Kergil for The Trevor Project at Hollywood Palladium in Los Angeles, California on December 7, 2014. Sarah was also seen with Kelly Osbourne and had a chance to take the stage and speak in front of the audience with actor, Nolan Gould. Check out more great pics of Sarah below! 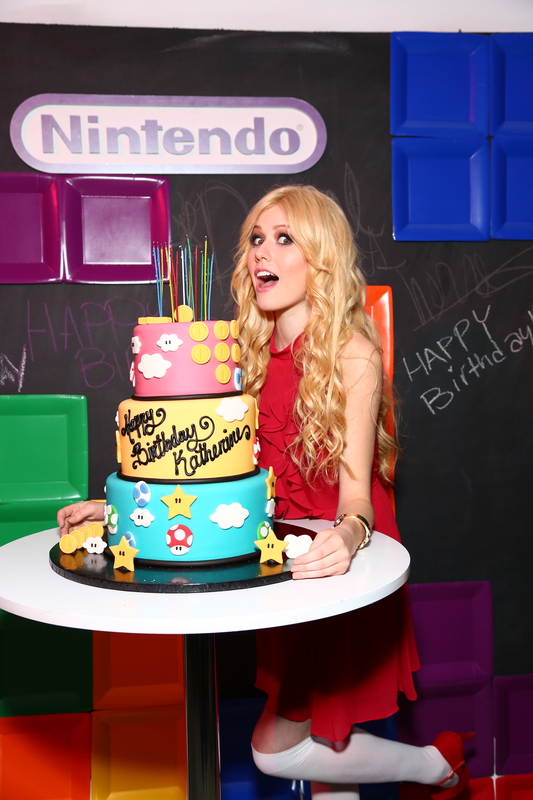 PHOTOS: Katherine McNamara Celebrates 19th 90’s-Themed Birthday With Nintendo! On Saturday night (November 15th), family and friends of Katherine McNamara including Sarah Hyland, Austin North, Dylan Riley Snyder, Nolan Gould, G Hannelius, and many more, gathered to celebrate her 19th in the 90s “1-Up” Birthday Bash at Siren Studios in Hollywood, CA, hosted by Nintendo. The space was transformed into a 90s wonderland as guests came dressed in their finest 90s gear and enjoyed a fully stocked candy bar, bean bag chairs, a photo booth filled with fun props, a t-shirt printing station, a Tetris wall that made for some awesome photos, 90s themed decor such as boom-boxes, and of course Nintendo 3DS and Wii U stations spread throughout the event. Guests took a break from mingling and dancing to stop by the warp pipe gaming stations to get their hands on Nintendo 3DS and Wii U, playing throwback titles like Super Mario Kart, Kirby’s Dream Land, Super Mario World, Yoshi, and Tetris and current titles such as Super Smash Bros for 3DS, Mario Kart 8, Yoshi’s New Island, Kirby Tripe Deluxe, Tetris Ultimate, Just Dance 2015 and Super Mario 3D World. Individuals and groups also dressed up as their favorite Nintendo characters and danced around in the photos booth posing for fun photos that were printed on-site and projected on a wall inside the event. Guests were able to take away fun printed t-shirts with sayings such as “2 Legit 2 Quit” and “As if” as well as old school Mario and Link graphics printed on them. The perfect party favor for a throwback to the 90s bash! In addition to the interactive activities, attendees enjoyed classic 90s themed munchies such as bagel bites, grilled cheese, mashed potatoes, and chicken skewers. Guests also sipped on delicious Nintendo themed drinks including The Kirby, Luigi’s Field of Greens Green Juice, Yoshi’s Basil Lemonade, and Bowsers Orangeade. The event wrapped up with everyone singing “Happy Birthday” to Katherine who was presented with a custom Nintendo birthday cake. Check out all these fantastic photos from Katherine’s Nintendo bash filled with family, friends, food and fun below! Happy birthday, Katherine! We sure hope you had a great time at this event! 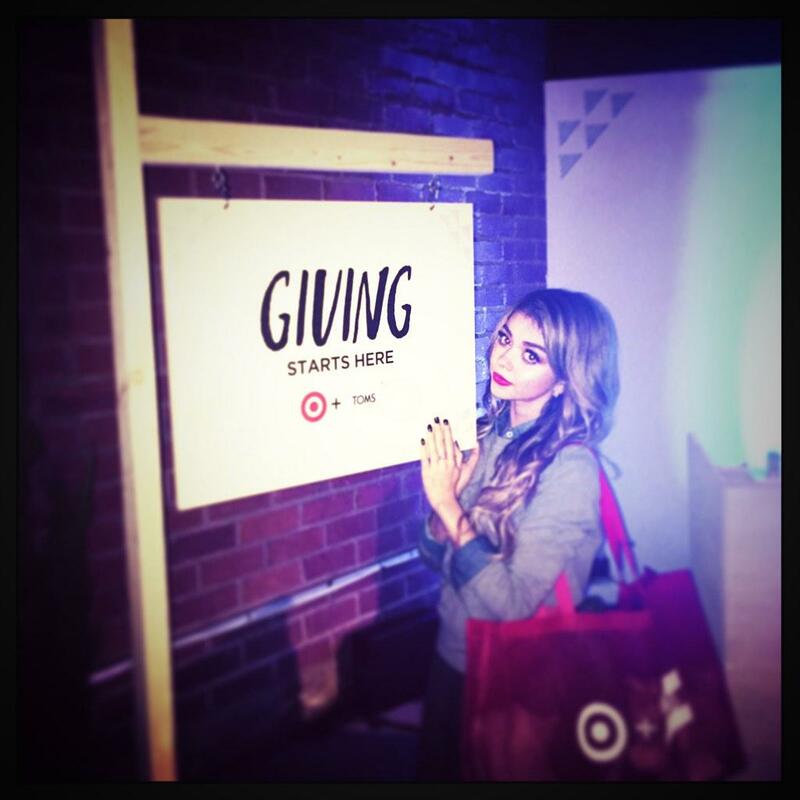 Sarah Hyland attended the special TOMS For Target launch in Culver City, California on November 12th. Sarah rocked her Toms with fit for fall sweater and skirt. We love her event look and can’t wait to see what Toms and Target will team up to bring us in fabulous fashion for your feet coming soon! Check out more photos of Sarah‘s time at the Toms event below! Sarah Hyland Spotted Out And About In LA On Halloween – Pics Here! Sarah Hyland spent the early part of her Halloween, October 31st, out and about in Los Angeles, California. Sarah rocked a casual cute look on the gray, rainy day by keeping warm in a plaid long sleeve shirt, white button up, jeans, and ankle boots. Would you rock her look? 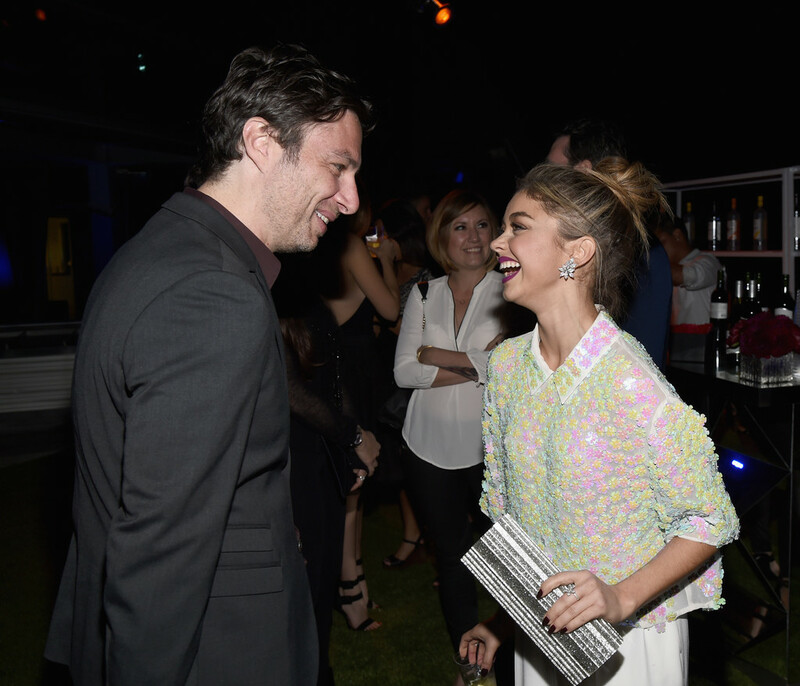 Sarah Hyland Attends Samsung Galaxy Note 4 Party In LA – Pics Here! Sarah Hyland was a colorful queen on October 26th as she attended a special Samsung Galaxy event in honor of the new Note 4. Sarah shared smiles and laughs with the other guests in attendance including this hilarious Zach Braff (pictured above), James Marsden, and more. Stars Attend Nolan Gould’s 16th Birthday! Young Hollywood stars came out in full force on October 26th in Los Angeles, California to celebrate Nolan Gould‘s 16th birthday in style! Nolan celebrated with his friends including fellow celebs Sarah Hyland, Ariel Winter, Katherine McNamara and more! Nolan and friends shared smiles, hugs and smooches as the helped Nolan celebrate his big day. We hope he had a fantastic birthday!! 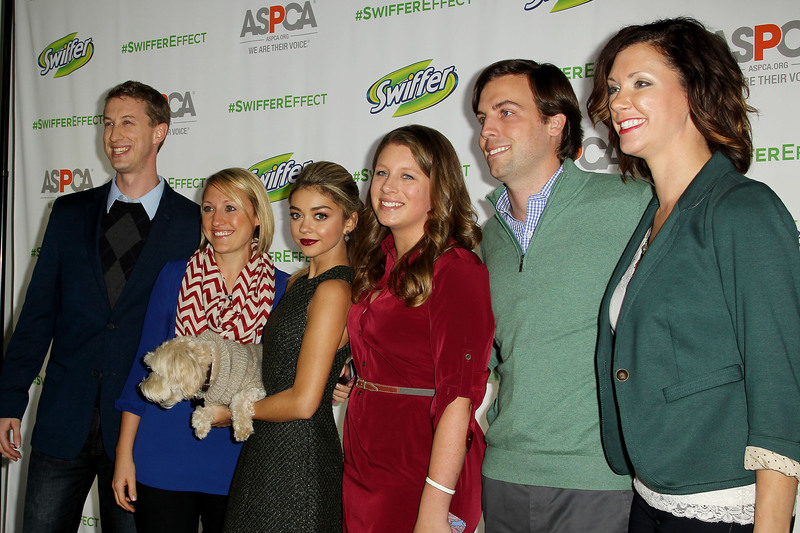 Sarah Hyland Hosts ASPCA Event With Her Dog Barkley! Sarah Hyland and her adorable dog Barkley were the hosts of a special ASPCA event in New York yesterday, October 21st. Along with her hosting duties, Sarah looked lovely and happy to have Barkley in her arms on the red carpet as she posed for photographs and mingled with friends and the other guests. Sarah Hyland Spotted At ‘Good Morning America’ New York! Sarah Hyland and her adorable furry friend were spotted at ‘Good Morning America‘ in New York on October 21st. Sarah embraced a fall look with a white mesh shirt, orange pants and a warm stripped jacket. Her pup even wore a cute gray sweater to match! Sarah Hyland Hits Up ‘Rockwell Table & Stage’s Halloween Party In LA – Pics Here! Sarah Hyland was spotted at enjoying Rockwell Table & Stage’s Halloween party in Los Angeles, California on October 18th. Sarah rocked a pretty black dress as she and her friend headed to the party. Sarah even was spotted with a new short black wig as she got into the Halloween spirit. Do you like Sarah‘s Halloween look? Check out the photos below and let us know in our comments section.